being offered in Blog Design to assist you! - not such an easy question I tell you! (and let's face it each of us has their own unique style!). and I am very happy with the result! I love it! 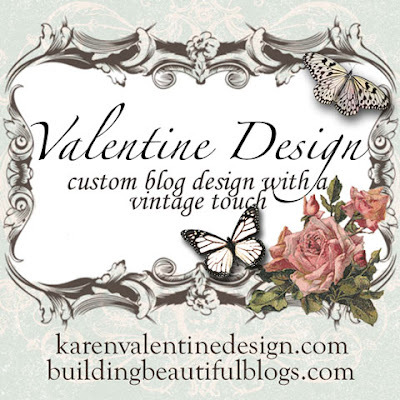 Karen is so talented and all of the blogs she has designed are oh so beautiful! I have contacted her once, but I didn't follow through, and I really need to. This is making me look again! Great job, Karen, Suzy's blog looks fantastic! Your blog makeover is just perfect! Karen did a great job! I love your new blog Suzy!!!! It looks SO YOU! I also adore your new profile photo : ) my beautiful friend! I couldn't believe how many lovely posts I have missed here. You have been making so many pretty things. I can't wait to see your creative space at Karen's party this year. Have a wonderful rest of your week Suzy. What a great new look Suzy, Karen has worked her magic once again. Nice new presentation, but the other one was too! The most important is to present your own creations! They're really yours and so beautifull! Karen is so talented and easy to work with, she has done a beautiful job with your blog!!! Enjoy! Suzy, dear ,it looks wonderful --CONGRATULATIONS ,I LOVE your new look, so clean and "simple" and I love your header Suzy. Karen makes wonderful works, and as you know, she also did mine, which I`m still so happy to see,every day. I think it is great that your photoes don`t gets into the text anymore -love you on the photo sweetie- and your text:" about me" is lovely, and perfect for what you are and makes. I just love your new look.Karen is really talented and did a wonderful job.Have a wonderful weekend. Your blog is so beautiful. Karen does such a wonderful job. I am having her do mine soon, so excited!! Your new blog looks fantastic. Karen did a great job again. Have a nice weekend. I'm staying in France on the moment. Will email you after i'll be home again. Great job, your blog looks so fresh and bright and your work shines out more clearly. It's a great investment and definitely worth it. We all need to make changes from time to time. I simplified mine a while back for easier maintenance. Brighter and cleaner. Now, I just need to keep it that way. Yours looks great. Karen has done an amazing job with your blog. It looks absolutely beautiful. Hope you are having a great week. I know that Karen is so talented and she has proven it with your beautiful new blog! 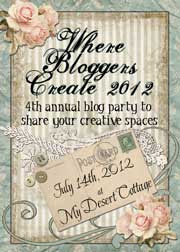 I'm going to blog hop too this year, my first time. Fun huh?! Hello my dear Suzy, Your new blog outfit looks fabulous! I like the softer colors, the distressed background and the pretty flourishes. Karen has done a great job again. I'm looking forward to taking the studio tour :-). Your new blog look is lovely - very fitting to what you do. It looks classy! Fabulous new makeover. Its so YOU. Karen did a wonderful job. I couldn't sleep and thought I would pay you a visit. I absolutely love what Karen has done to your blog! She is so talented! It really makes your photos stand out and so easy to read! And I love the blog head-gorgeous! I can't wait to see your creative space! Hi Suzy- YOU look beautiful!! Sweet Karen has given you a lovely new dress for the party!! You will be the belle of the ball! I'll be at the party too-- it's the only way I can make sure that my craft room gets a good cleaning! !